It is called “Kikaigashima” in the Kita school while is “Shunkan” in the other schools. The time is the late Heian era when the Heike clan was at the height of its prosperity. 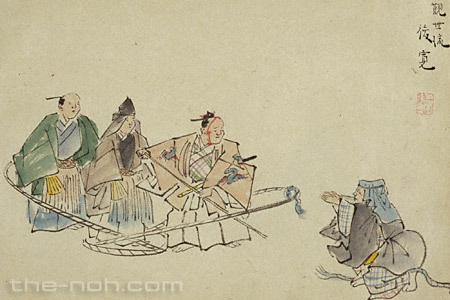 The Buddhist priest Shunkan, who was ranked at Sōzu* and served as Shigyō (or Shugyō) Administrator** of the prestigious Hosshoji Temple in Kyoto, plotted to bring down the ruling Heike clan and was arrested. He is exiled to Kikaigashima Island in Satsumagata (the sea off southern Kyushu) with his fellow conspirators: Fujiwara no Naritsune and Taira no Yasuyori. Time passes, and a contingent general amnesty is declared in the capital to pray for the safe birth of a child of Taira no Tokuko (or Tokushi, Noriko), Consort of Emperor Takakura and a daughter of Taira no Kiyomori. Since a portion of the exiles in Kikaigashima Island is granted a pardon by the amnesty, an envoy is heading to the Island. On Kikaigashima Island, pious Naritsune and Yasuyori have selected places in the island as makeshift holy sites of the three grand shrines of Kumano and make a pilgrimage there for prayer on a regular basis. One day, Shunkan meets them on their return from a daily shrine visit and offers a cup of valley water which he pretends is kiku no sake (sake with chrysanthemum petals). They enjoy the party and miss Kyoto. Then a messenger from Kiyomori arrives on the island with the good news. 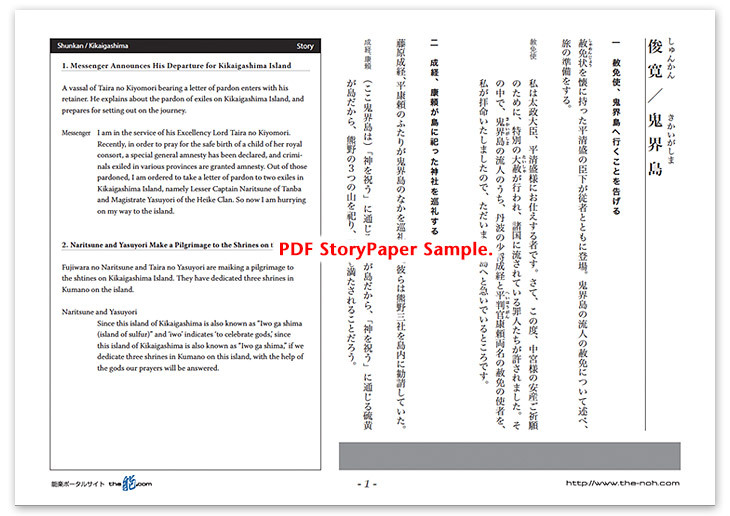 However, there is no mention of Shunkan’s name in the letter of pardon. Shocked, Shunkan sinks into the depths of despair while people around him are unable to find words to consol him. Soon the boat with Naritsune and Yasuyori on board sails away from the island. Although Shunkan throws himself on his fellow’s sleeve and begs to let him on board, he is mercilessly abandoned and lies prostrate on the beach. As he cries hard without caring anything, his fellows call out, “One day you will be able to return to the capital. Pull yourself together!” But the voices grow faint as the boat recedes into the distance and finally disappears from view. *Sōzu: One of the positions of Buddhist monks, which is ranked under Sōjō and above Risshi. He supervises monks and nuns. **Shigyō (or Shugyō) Administrator: A monk who administers the office work of a temple. This piece was created for Noh performance based on the tragedy of the priest Shunkan told in the Tales of the Heike (Heike Monogatari). It is said that Kikaigashima Island, the place of exile is Iwojima Island, one of the three islands which are located west of Tanegashima Island and Yakushima Island in the southern ocean off present-day Kagoshima Prefecture. Although its name is the same as the island which became a battlefield during the Second World War, it is a different island; it is also called Satsuma-Iwojima Island. On the tiny island which is about 9 miles (15 km) around and 4.6 square miles (12 km²) in area, there is an active volcano, Mount Iwodake (2,322 feet, or 703 m), which even today is shrouded in its own fumes. Sulfur is exposed on the rocks and even the sea water around the island is dyed the color of sulfur. It is certainly an alien world, if we compare it with Kyoto where Shunkan once lived. On the island, Shunkan spent desperate days as an exile with no hope for the future. However, probably because the presence of two fellow conspirators consoled him, his state of mind – missing Kyoto and exchanging cups of water that they pretend to be sake – indicates a degree of leeway in his heart, even under such miserable conditions. The envoy appeared. Filled with hope, Shunkan is grateful. However, the brilliant hope disappeared in a moment. He learned that his name alone was not mentioned in the letter of pardon, and he thoroughly and repeatedly examined the letter, facing the inconceivable reality. He who could not find his name shivers with anger and frustration. Separated and left behind alone on the isolated island, he was pushed into the abyss of even darker despair. Nothing would be comparable with his pitiful situation. This drama unemotionally but clearly describes his despair in the movements of performers, which are not at all showy but well-controlled, and in the finely-tuned chorus like deep ocean waves. When we see and listen to this performance, we feel the underlying power of expression in Noh art.